Interrupts disabled on odd numbered cores using the /usr/sbin/psradm command. The six application server instances were hosted in separate Solaris Containers. was run in the default processor set. DB2 processes bound across all processor cores using /usr/sbin/pbind. One Solaris Container used for the satellite driver. The Emulator ran in the default Solaris Container. System was divided into 3 logical partitions using Solaris Containers. Each logical partition is a satellite driver. System was divided into 4 logical partitions using Solaris Containers. 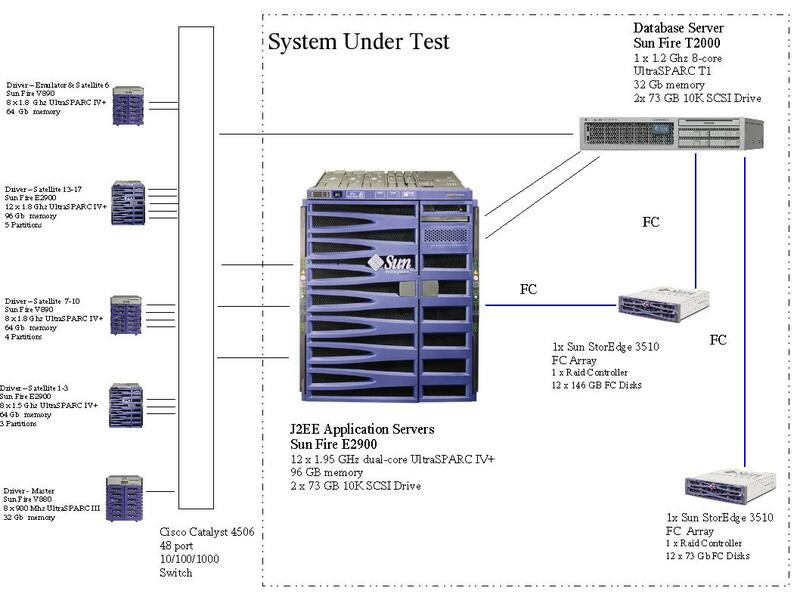 System was divided into 5 logical partitions using Solaris Containers. the two Sun StorageTek 3510 arrays. This extrapolates to 17.35 GB of storage for a 24 hour run. logical drive to store the database files.